Did TotalBeauty just posted this product up because I was really expecting way more reviews on this? This has been floating and raved about around the YouTube community like crazzzyyyy and when this came as a sample with my Ulta purchase, I knew I had to try this out before it went out of stock. I'm so glad I tried this. Now I'm a believer although I wouldn't necessarily pay $38 for the full size ...read moresince I still think you can find comparable dupes at a drugstore price. (Ah-hem, Makeup Revolution highlighters!) The shimmers in here are so finely milled that it looks like I'm glowing from within. This is a very strong highlighter but not too much pigmentation that it looks unnatural either. I hate subtle highlighters and this hits the spot. It also lasts a decent amount of time although I do have to touch up halfway through the day. I'm really starting to fall in love with Becca products. 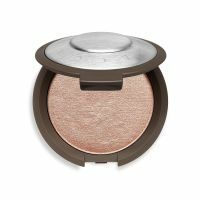 This highlighter is beautiful and gives me a super pigmented glow (but not clown like). I feel radiant wearing this. From the substantial yet chic packaging, to the creamy shimmer, everything about these highlighters is perfection. There are so many to choose from, but my current favorite is Lilac Geode. It's lilac in the pan, but applies as a super flattering rose gold with a pink shift. The pigment, texture, and wear-time are all top notch, and it photographs beautifully as well.